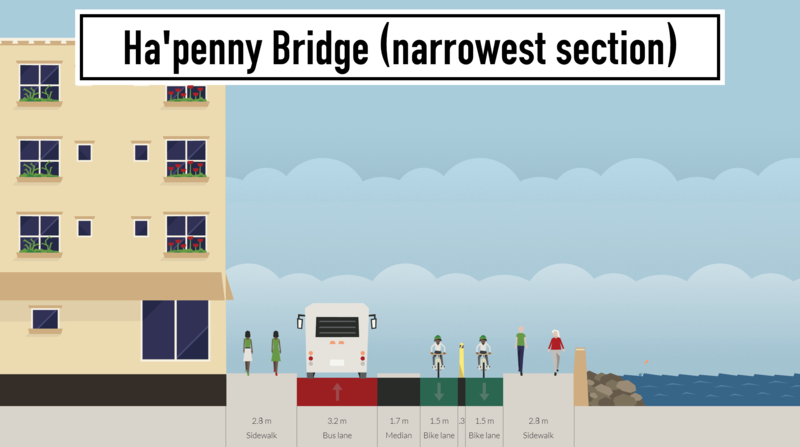 NOTE: There was good deal of guess work in our estimated measurements of how wide the street sections are but there’s also wiggle room in our cross-section — the footpaths, cycle paths, or traffic lanes in places can be made smaller. We’re open to correction if anybody has accurate measurements. NOTE: There are currently no officially published detailed plans or route options. 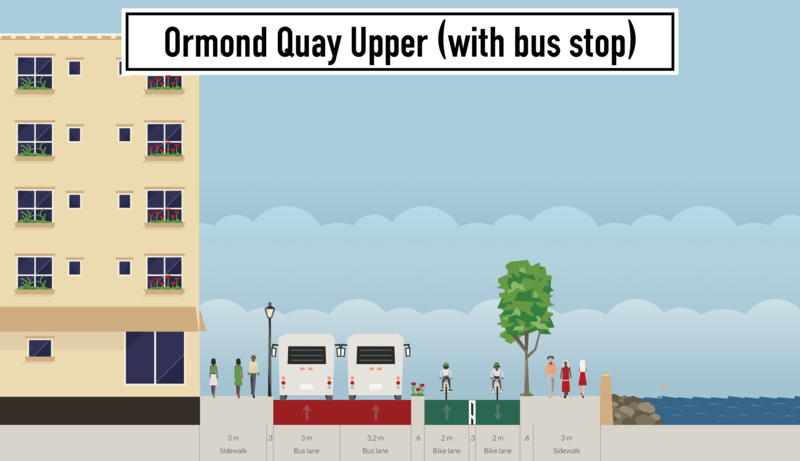 Bus users: BRT-like bus lanes would offer more reliable access due to be less interrupted caused by congestion, bus-only overtaking space at bus stops, less stops which hold up the majority of users, bus lanes uninterrupted by cyclists. 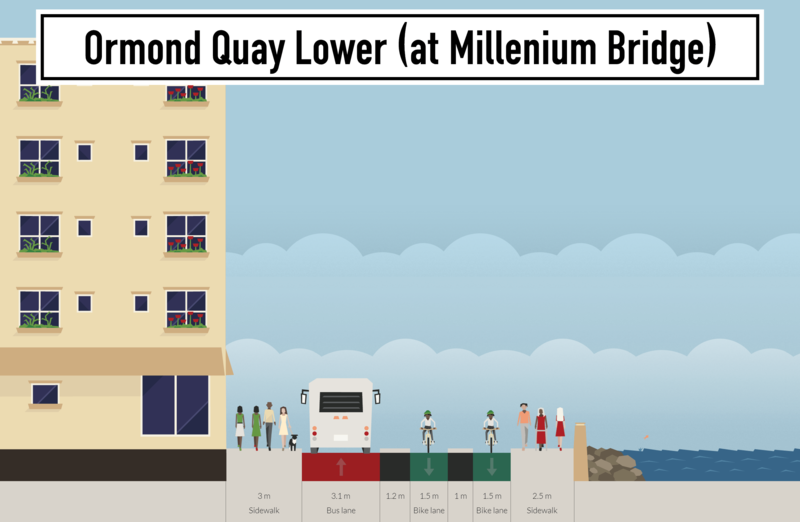 Pedestrians: Would gain from safer and notably larger footpaths on most quays, in some cases vastly larger footpaths, spaces to sit and enjoy, and crossings along the quays allowing people of all abilities to walk along the quay-side (which is not currently possible!). Users with disabilities: While the quays and even more so the quay-side is currently unattractive to pedestrians, it is often inaccessible to users with disabilities due to the lack of crossing, drop kerbs, and space — any project would fix these flaws. Businesses: Along the quays and in the area would be in a more attractive environment, and those on the quays would have a far better chance of fitting seating outside. 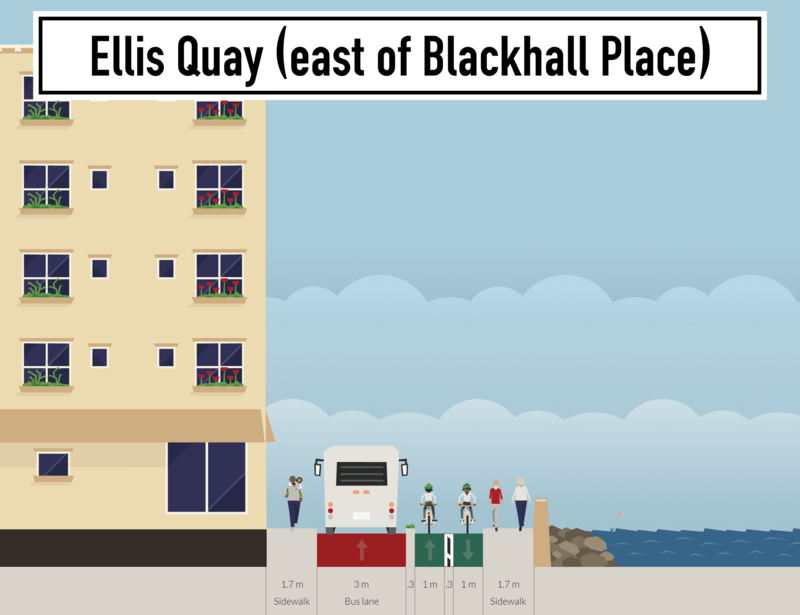 Residents: Quieter homes, and quieter and safer streets for the larger number of quay-side homes (most quays include apartments), better access to park-like settings in short walking distance, good walking/cycling access larger parks etc. Tourism: A quay-side walking and cycling route between the O2 and the Phoenix Park would link a large percentage of tourist attractions including the Zoo, the Guinness Store House, the National Museum of Ireland at Collins Barracks, Christchurch, the GPO, Smithfield, Temple Bar, the Irish Museum of Modern Art, College Green, the Wax Museum, The National Leprechaun Museum, the Bord Gáis Energy Theatre, the Convention Centre Dublin etc. The tax payer: Congestion costs the economy, while seating outside businesses is a revenue earner . No driving lane on quays beyond Blackhall Place! 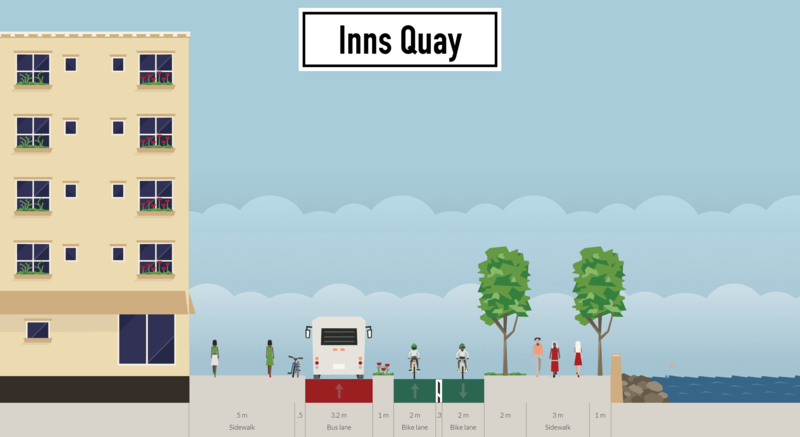 Design could be used quay length (ie from Inns Quay to Capel Street) or only along part of the quay with extra space used on building side for cafes tables or quay side for planting or extra wide footpath. If you have managed to look down this far, please do post a comment below or tweet us at @cyclingindublin or email ideas@cyclingindublin.com! There are quite a few sections there where a single bus lane is “boxed in” with planted borders. I’m not sure what happens to the buses if that single lane gets blocked somehow – perhaps by a garda car or ambulance attending an emergency, or if there are roadworks – as there is no way for the bus to pass. Towing/emergency (slow and controlled) access could be provided by having gaps in the planted borders (or indeed, maybe the planting could be ruled out for such reasons). Towing could also be provided by tow trucks reversing from the next junction ahead. Roadworks should be done outside of peak times and diversions should apply. But emergency works could also use gaps in the planted borders and traffic lights could be used allowing the free lane to alternate from buses to cyclists. 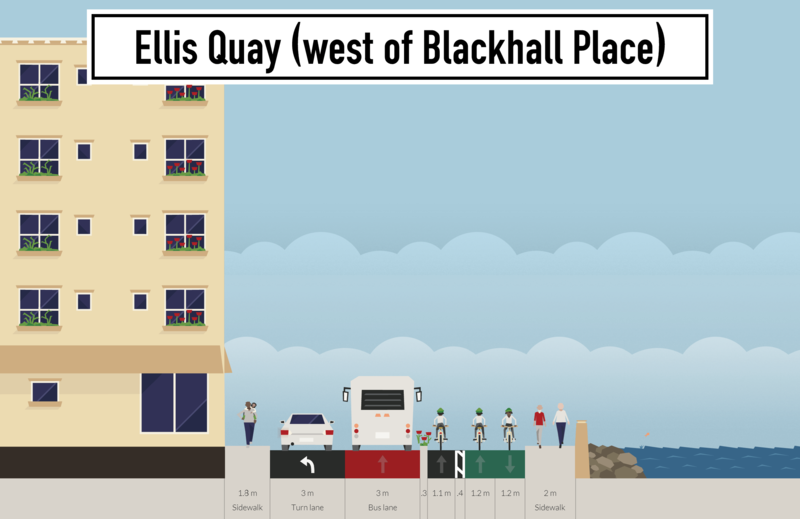 That’s all based on the workshop layout I based this off — one solution I’ve thought of is to keep eastbound private traffic on the north quays (in much of the space that the bus lanes are pictured above). 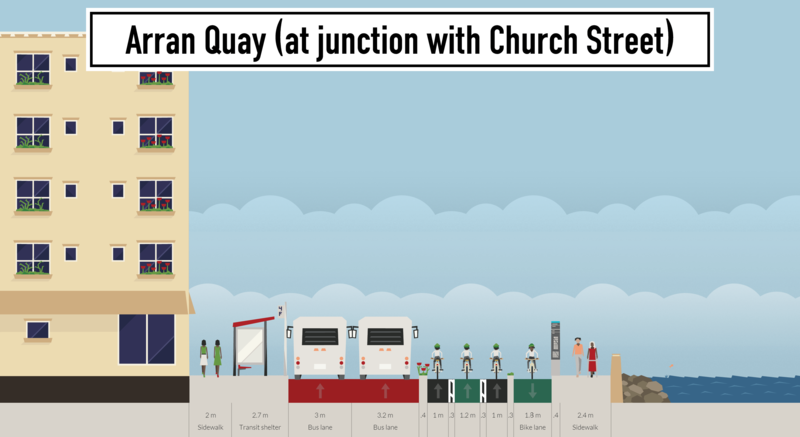 On the south quays would be two-way BRT, with a compromised 500 meter one-way section between the Ha’penny Bridge and Wood Quay. At first glance, this looks good. There may be small design issues that may need tweaking but overall is excellent. Currently it’s difficult to cross the city centre west-east on the Northside without having to dismount/walk and finally end up on quays as a last resort. 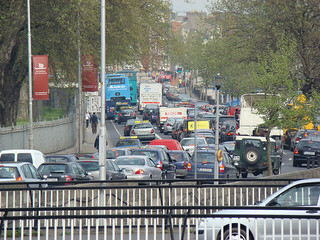 The Luas and the one-way streets contribute to these difficulties further. This would have a similar positive impact as the Grand Canal Route. To make it work properly, a number of other things would have to be done as well. First the 30 kph speed limit (and 50 kph) would have to be actually enforced. Next the Liffey bridges, especially Millenium and Sean O’Casey pedestrian ones, would have to have proper cycle lanes. 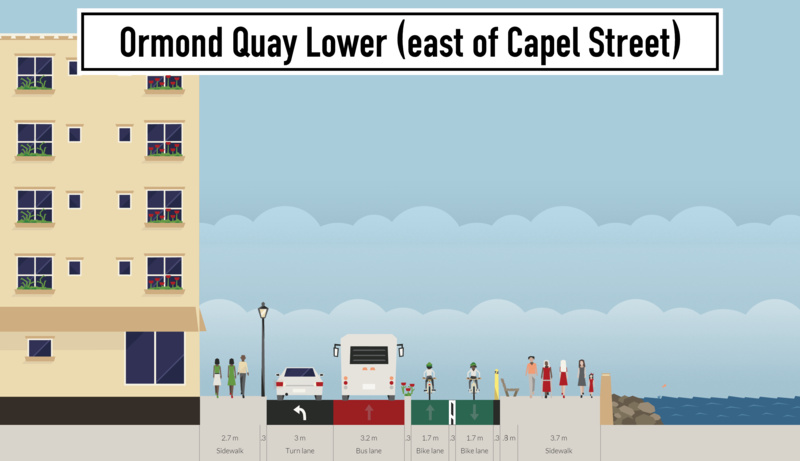 Lastly the one-way streets feeding into this that are wide enough need contra flow cycle lanes. If this is fully implemented, it would go a long way to improving the city centre. There must be a way to get the buses away from the quays completely, at least between Grattan and O’Connell bridges. Bus lanes means also taxis so I do see a lot of traffic still in sections, especially as taxis now have and easy corridor. Also the ugly monolithic boxes really spoil the view (noticed how nice the quays looked during the recent strike) and make a lot of noise, making a nice stroll along the water a fantasy. This is a good idea and you have done a great job of visualising it for us but I don’t feel it goes far enough. I have posted this in other places before, myself and my partner have a vision that we feel very strongly about, that motorised/non-electric traffic should be removed from the Liffey altogether, thereby creating a healthful, clean and human centred heart of the city. The North quay (which gets the most sunshine which we really need in this city) should have a combo of cafe/restaurant/bar terraces, mini parks with either kids play areas or exercise areas with street equipment, and areas for sitting, sheltered areas which protect from the wind and rain while still being outside, skate parks, performance spaces, basically every kind of civic space we can imagine. Kind of along the lines of the “corridor of rooms” idea that the 21st Century Liffey project talks about. There should of course also be a cycle/skate track and pedestrian walkway all along. We envisage this connecting Phoenix Park to the Docklands and hopefully eventually the sea front where a large ocean front park replaces the port (which moves to Rosslare). On the South quay there should be a commuter cycle and skate track (where people go fast as opposed to leisurely on the North quay) and commuter pedestrian track, with an electric trolley system that runs on regular tires with wires over head using existing lamp posts and buildings. These would all connect Heuston Station with the Grand Canal dock area/Ringsend. This would have to be done in conjunction with an extensive roll out of park and ride facilities plus potentially a congestion charge type of thing for bringing vehicles into the city centre, both of which could subsidise cheaper and more widespread public transport. And other vehicles like taxis/buses and private cars would only be allowed to cross the river at some bridges with pedestrians and cyclists being given priority. Also, we should construct a circular underground tunnel for traffic with various ingress and egress points around the city, so that traffic wanting to get across town could do so without the need to stop for traffic lights and pedestrians. See the massive underground motorways in Madrid for example, in comparison ours would be tiny and would not cost that much. One reason people like our city is that it is comparatively small for a capital city and it is so easy to get around on foot or bicycle. We need to turn the priorities on their heads and instead of just trying to squeeze the traffic into a smaller space, get rid of it altogether in some places (or put it below ground) and prioritise the pedestrian and cyclist etc over the motorised traffic, reclaiming the civic space. If the entire spine of the city was as I have outlined above, it would revitalise the city centre, instantly being cleaner, and more peaceful, allowing us to refocus on more healthful, positive and creative ways of being around each other, and attracting both Irish citizens and foreign visitors alike to spend more time in the city centre. It would also make us unique and groundbreaking. PS much of what I have said above has been said in one form or another before I am not trying to take credit for it all, some of what I have said above has already or is already being implemented elsewhere but just not in it’s entirety. The redesign would help keeping traffic to the limit – it would make enforcement easier because the design would lead to more self enforcement (smaller lanes and fewer lanes = lower speeds). Ideally use of the space on the current bridges (and contra-flow etc leading to them) could be included in this project or done as a quick follow up. But I think the pedestrian bridges, especially the Millenium Bridge, needs to be left to pedestrians. On the northside, there’s very few wide east-west routes available for buses between the quays and the North Circular Road. On the southside, the James’s Street to Dame Street route is already congested and even if buses were only diverted at Grattan Bridge, these would need to use College Green which is already congested with buses and due to get worse when Luas arrives. With the above illustrated plan you would get a lot of cafe/restaurant/bar terraces, and some small-scale linear mini-parks. More importantly it would act as a corridor with safe and attractive walking and cycling routes linking the people who live and visit the city centre with a number parks and public spaces – most directly with the Phoenix Park and smaller parks, playgrounds and squares in the city and the Docklands. A short enough planned section of S2S route would create a link to Fairview Park, the seafront park at Clontarf, and Bull Island. Links to the Grand and Royal canals are progressing, and so are plans for a route along the River Dodder. A planned bridge would link the route to the nearby Ringsend Park and Sandymount. On the radical scale from 1-10 the above plan I’ve pictured might reach 5, while your one would be off the scale. That and extra cost of providing electric-powered buses and a circular underground tunnel for traffic, would be the killer to your idea. We don’t have the money for electric buses right now and likely will never have enough to justify underground motorways. In any case, Madrid with its underground motorways has a population of over 6.4 million people and is the capital of a country of 47 million people — Madrid has the same population as all of the Ireland, including the North and Dublin by the way is at just 1.8 million. Cities around the same size and made up as Dublin – such as Amsterdam – are far more relevant examples to follow. Re the Ha’penny Bridge: Is it the ‘at crossings’ section which is not clear? To the left of the road is a depiction of the small square currently in place. The building line along the quays is about where the first tree is, also to the left of the road.